As far as I can Google it, it seems that Janodet is perhaps the one top-quality producer in Beaujolais who does not eschew sulphur. So maybe I was hasty in opening one of the few Crus that I could have safely cellared, but after contemplating my sole bottle for almost a year, curiosity got the better of me. However much it may discomfort me to say goodbye to this sole bottle, this is already tasty, with a velvety smoothness (as opposed top-flight Cote d'Or silkiness) that is borne of very fine tannins and coupled with acidity that makes the mouth drool rather than pucker, leading to a crunchy, saline finish. The aromatics are TCB Beaujolais Cru: black cherries with minerals on top, unfolding their complexity very nicely with air. At this point in its evolution, it's a little too close to the Lapierre Morgon stylistically for me to tell them apart (which is at least appropriate -they're at the same level of quality), but my, doesn't it really taste good! And that vibrant acidity is to kill for. About 20 GBP in London. Hi Chaim, thanks for your note. 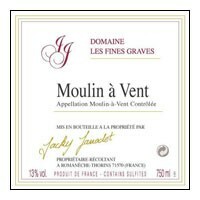 I actually had a note from last week that bears comparison: 2009 Domaine Thibault Liger-Belair, Moulin-a-Vent, Vieilles Vignes, Beaujolais, France. This wine had a relatively round fruit-forwardness similar to the Flower series of Georges Duboeuf, though with a fairly good acidity and slightly chalky/dry finish that all made for a very nice Moulin-a-Vent picture. It took a while to open up, and my glass (of poor quality) began to show wonderful aromas of black fruits like dark cherry and minerals after about an hour or so of swirling. Very tasty, and with room to improve over time. Got it for 26.99 at Schneider’s on Capitol Hill.